We are Bart & Danielle. We fell in love in ánd with Buenos Aires when we arrived here last year. We are originally from the Netherlands but we both came to BsAs to dance the Argentinian tango, work at a ranch with horses (Bart) and to write a book (Danielle). We now live in Villa Crespo together with cat Rasputin and the nameless garden turtle. 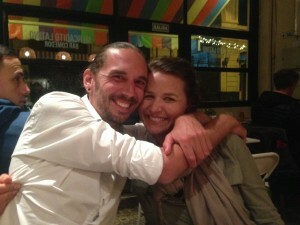 As we both are and have been vegetarians for about 15 years, you may think Buenos Aires is not the place to be for us. Yet, we were pleasantly surprised to find that the city we love actually has heaps of great vegetarian, vegan, bio and organic places. When we could not find a handy map of vegetarian/vegan restaurants and shops in town, we decided to build our own :-). So, we love for you to help us!